a series of rule and policy changes: reforms to public funding and fundraising, the banning of factional binding, and direct elections for party positions and for union delegates to conference. Country Labor Conference is this weekend. All were rejected on the grounds that members ought to be satisfied with the reform that was achieved at the 2014 Annual Conference. There are two motions in support of Jodi Mckay. Both motions were ‘noted’ (i.e. rejected) with the words “Country Conference would like to thank Jodi McKay for her commitment to the Labor Party”. There is to be no apology, no expression of regret, no admission that Labor was in any way responsible for what happened. There is no commitment to expel or otherwise discipline those responsible. And there is a motion asking for help with providing posters for polling booths that Labor no longer has enough membership to staff. Response in full: “Note”. 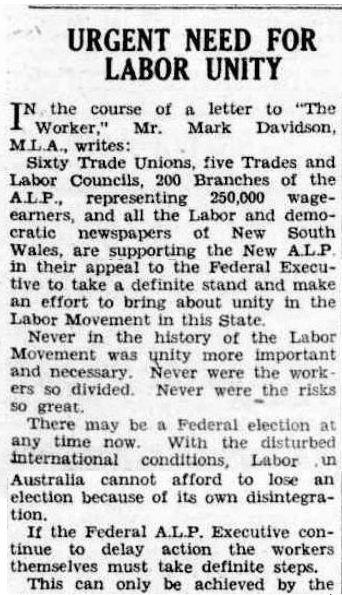 We are writing to invite your Branch to join the Erskineville Branch of the ALP at a conference to celebrate the 75th anniversary of the landmark Unity Conference which was held in our suburb in 1939. The Unity Conference was a major milestone in the evolution of NSW Labor at which the deep divisions of the Lang era were overcome and a set of rules agreed which still largely govern the Party today. We are inviting each local Branch in NSW to accredit two delegates to this anniversary event, where a range of ideas for Labor’s future will be debated. Come along and take part in a debate on party democracy and reform. The Conference will take place in Newtown on Saturday 15 November and will be followed by a Labor history walk in the afternoon and a celebratory dinner in the evening. If we want to see John Faulkner’s vision for a reformed Labor Party come into being, we need to pass these motions at our branches, as many branches as possible. But that’s not enough. We need to pass these motions at electoral councils and electoral assemblies. We need the motions to be sent to State Conference and Federal Conference. But that’s still not enough. We need to send delegates to State and Federal Conferences who will vote for these motions. There have been a lot of good motions that went down at conference because delegates didn’t support motions that their own electoral councils and assemblies and branches had passed. Once we have delegates at conference who are prepared to support these motions, then we’ll see real reform. Senator John Faulkner: Public Pessimism, Political Complacency: Restoring Trust, Reforming Labor. I have always believed that politics is worthwhile. This is not, nowadays, a popular view. John Faulkner to speak on Reforming Labor. John Faulkner will be speaking on reforming Labor. RSVP: Daryl Melham: darylm@rwc.org.au by 3/10/14. Please pass this on to any supporters of the cause of Labor reform who may wish to attend.